Sterling silver ring inlaid with spiderweb turquoise and gem silica. 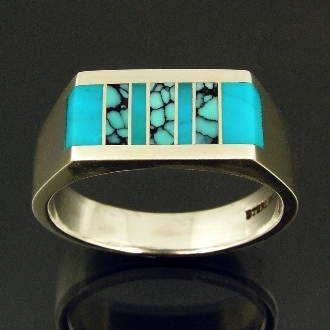 Our Products >> Silver ring inlaid with spiderweb turquoise and gem silica. Spiderweb turquoise and gem silica ring in sterling silver by Hileman Silver Jewelry. The inlay is alternating blue gem silica with 3 pieces of spiderweb turquoise. High quality spiderweb turquoise is highly sought after and commands a high price in the west. Cutting the turquoise to maximize the beauty of the spiderweb is the key to making a great piece of jewelry with spiderweb turquoise. The webbing is random and never the same from piece to piece, making this ring a truly one of a kind piece of jewelry. The ring measures 8.6mm wide and is shown for scale in a size 11. This ring will be made to order in your size in 4 to 6 weeks. To view a video of this spiderweb turquoise and gem silica sterling silver ring please visit our You Tube channel.